Instrumental jazz/bebop compositions featuring guitar in a trio setting. Internationally acclaimed, Oz Noy is noted as one of the top studio and jazz musicians in the U.S. today. The Israeli-born guitarist possesses a strong, fluid vocabulary specializing in jazz and bebop but also crossing over into all other genres of music to include funk, blues, and pop. His uncompromised talent in composition and jazz improvisation provides a solid foundation, taking jazz to a whole new dimension. With an exceptional understanding of technique and technology, Oz Noy crosses the barrier of sonic bliss creating the lush textures and sounds of a visionary — he takes the listener into uncharted territory. Noy’s third album, Fuzz, contains guitar-based instrumentals backed by bass and drums. In writing style, Oz has an exceptional talent for taking a single riff or groove motif and writing around it to create his compositions. His vast vocabulary as a jazz musician coupled with an unprecedented harmonic understanding is a major contributor to the adventure one takes when listening to his music. Oz Noy is definitely a master of soundscapes and sound design. You won’t find any strangers to the music scene on this album. Oz Noy surrounds himself with top shelf musicians. Fuzzy was recorded with players including drummers Anton Fig, Keith Carlock and Vinnie Calaiuta, bassists Will Lee, James Genus and Jimmy Johnson, and keyboardists Jim Beard, Shai Bachar, and George Whitty. Nice company to keep! Listening to the opening track “Which Way Is Up?” will give you a great introduction to the level of musicianship found throughout the entire album. The first thing you will hear is a textured loop created by Oz ­— a small demonstration of his ability to color his guitar into a rich texture and incorporate multiple soundscapes within his compositions. As the drums set the grove, Oz kicks in some nice harmonic structures supported by the bass line. Once the harmonic line is stated, Oz states the melody, and throughout the composition, switches back and fourth between harmonic and melodic passages before going into an all out improvisational jam. This track will definitely have you begging for more. The title track “Fuzzy” is actually quite funky, laying down a gregarious groove. The solo/improv section will take you into an outer dimension exhibiting some extreme sound coloration infused with jazz/bebop solo lines. You’ll also find some nice drum soloing by Keith Carlock. Be sure to check out the textured loop Oz created underneath this section. There are so many nuances and surprises throughout. Every time you listen to this album, you’ll be amazed to hear something new. “Three Wishes” is a beautiful ballad showcasing excellent chord melody work by Oz. His chordal structures and textures are extremely effective in creating a certain vibe or atmosphere. “Intensity” will take you to the world of SRV. This track is extremely heavy with a blues groove. But wait only a few seconds and the solo section takes you to the unexpected again. You’ll be taken all the way to the edge — both melodically and rhythmically. This track also features some tasty play from drummer Anton Fig. You’ll even find some fun instrumental renditions of other artists’ compositions including “Sometimes It Snows In April” by Prince, “In a Simple Way” by David Feldman, and “Evidence” by Thelonious Monk. All done in the style of Oz – a complete wizardry! This is one album you should treat yourself to. The creativity and talent alone will far exceed your expectation and imagination. It will call you back for multiple listening sessions to wet your own creative pallet. If you are in the area, be sure to check out Oz Noy at The Bitter End in New York City. Check listing for performance dates/times – Oz can usually be found performing there on Monday evenings. Electronic rock with a dark edge. Echostream’s second full-length album takes off where the previous release ended, adding a second drummer and plenty of guitars to make their sound heavier, more electronic, moody, and just plain bigger and better than before! Japanese vocalist Ryoko has a haunting voice that plays like another instrument in the overall sonic tapestry. Lyrically, she sings mostly about the darker side of relationships — after listening the album a number of times I fear for her happiness! Her vocal delivery makes us think of a female Trent Reznor mixed with a splash of Portishead’s Beth Gibbons (but throw a Japanese accent on top of it to make it even more unique). Tony lays down the musical foundation with lush synth tones, sparkling and shimmering and bubbling sounds, haunting vintage-sounding piano, and more. He’s probably the most amazing sound designer that ever lived — think Brian Eno fused with William Orbit and then splashed with a touch of BT. Of course, it could be that he’s one of the keyboard editors for MusicPlayers.com and we’re just a little biased — damn great stuff, nonetheless! Japanese guitarist Tomo brings a whole new dynamic to The Duality of Courage. Although the heavy guitar parts on songs like “Rip You Down” and the catchy “Contagious” are cool, the melodic delay lines in “What You Are” were especially moving. Tony’s synth tones mixed with electronic percussion laid down by CJ added a great William Orbit vibe to the track, making it one of our favorite tracks. “Static” was another great track; a mellow and emotive electronic ballad that would sound right at home in a gothic film soundtrack. Another stand-out for us was “Dragon,” a stripped down, up-tempo tune featuring great interplay between piano and guitar arpeggios, anchored by Jen’s acoustic drumming. Bass parts were handled deftly by Tony from behind the keys, laying down catchy bass grooves on tracks like “Contagious” and “Rip You Down.” Even after a live show, we didn’t notice the absence of a dedicated bassist until thinking about the performance days later! Fans of electronic and gothic music, J-pop fans needing something with more of an edge, and electronic music sound designers and composers, should check this CD out. A fantastic and humbling musical journey. When I was growing up in the ‘80s, I did not like the music of Frank Zappa. As a teenager it was way beyond my comprehension, with songs that were either too abstract (maybe that was jazz?) or too corny (though I did learn that I am what I is, and not to eat yellow snow). Years later and with my music appreciation in a significantly different place, I have a whole new level of respect for the brilliance of the late Frank Zappa’s songwriting. But even that appreciation wasn’t enough to prepare me for Zappa Plays Zappa, an incredible concert performance in which son Dweezil and his band spend three hours playing classic Zappa material perhaps better than the legend himself! 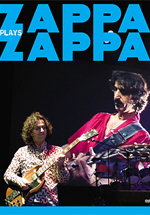 The Zappa Plays Zappa DVD was filmed during the acclaimed 2006 tour in which a collection of Frank Zappa’s compositions from the 1960s through the 1980s were performed by Dweezil Zappa (guitar, band director), Aaron Arntz (trumpet, vocals), Scheila Gonzalez (sax, flute, keyboards, vocals), Pete Griffin (bass), Billy Hulting (percussion and mallets), Jamie Kime (guitar), and Joe Travers (drums, vocals). Especially cool were songs in which the new players were joined by some notable alums from Frank’s old band: Steve Vai (guitar), Terry Bozzio (drums, vocals), and Napolean Murphy Brock (vocals, sax, flute). The set runs through a variety of styles, as Frank’s music library is quite diverse. It’s got a little bit of jazz, funk, pop, rock, prog, and musical theater all wrapped up in one truly captivating performance. Two of the Zappa Plays Zappa shows were beautifully filmed in high definition and recorded to capture the experience, complete with headstock-mounted guitar cams and a great 5.1 surround mix. For me to list tracks wouldn’t add much to this review since I really don’t know one of Frank’s tunes from the next, but I’ve heard from true Zappa devotees that the set list includes rare gems you’d have to be a diehard fan to specifically know. The concert lacks most notable “hits” (“Don’t Eat Yellow Snow” is perhaps the one exception) but instead presents a broader palette of material. Whether you're a long-time Frank Zappa listener or just a fan of musical theater, jazz, boutique guitar amps, and humbling musical performances, race out and pick up this DVD. It’s a concert experience not to be missed. Original band lineup delivers the classic Asia taste in an easily digestible manner. It’s been almost twenty years since the lineup of John Wetton (vocals, bass), Geoff Downes (keys), Steve Howe (guitars), and Carl Palmer (drums) performed together on an Asia album. After the first three classic albums, the lineup began changing, with numerous musicians entering and leaving the group over the following decades. 2008 finds the original founders reunited and currently in the midst of a world tour that focuses mostly on their classic songs, but they also perform a few tracks from the new CD. Musically, Phoenix isn’t so much about rebirth as it is about going back in time. The new CD sounds very much like Asia circa 1984, and a few tracks seem to be reincarnations of classic tunes with a few new chord changes and lyrics. While the opening single, “Never Again,” and the retro-pop tune “Alibis” deliver traditional Asia rock songs with mass appeal (if it were, um, 1984), it is the album’s most-progressive closing track, “An Extraordinary Life,” that showcases the real development and maturity of the exceptional musicians in this band. Most of the album is quite straightforward. It’s really anchored in straightforward pop songwriting that is more akin to classic singles like “Wildest Dreams,” “Don’t Cry,” and “The Smile Has Left Your Eyes” than songs like “Heat of the Moment” or “Sole Survivor” that fused the band’s pop sensibility with great technical and musical interludes. Songs like “Shadow of a Doubt” left us feeling particularly uncomfortable — the chorus is such a classic ‘80s teen movie soundtrack cliché that it reminds us of our geeky high school days a little too much! Steve Howe’s guitar playing — electric, lap steel, and acoustic, is in top form. His lead lines are a great template for how to solo throughout verses behind vocalists while not taking away from their lyrical performance. Sadly, though, his tone is uninspiring. It sounds like he recorded with his modeling amps instead of real tubes again. Downes, the man with more keyboards than fingers to play them, is also in top form performance-wise, but his sound is nicely updated with some new tones. Palmer delivers a solid, though non-attention-stealing, performance. And while John Wetton’s bass playing is fine (nothing especially outstanding), his vocal performance sounds a little tired at times compared to the musical performances. If you yearn for classic Asia, Phoenix delivers an enjoyable collection of easy-listening rock, with a few standout tracks like the closing track “An Extraordinary Life,” the progressive rock ballad “Parallel Worlds/Vortex/Deya” in which the band members stretch out musically over an eight-minute epic, and “Sleeping Giant/No Way Back/Reprise,” an up-tempo progressive piece that sounds like a missing track from the band’s before-its-time album, Aqua. Unfortunately, there are a few too many songs where the band was just too relaxed and a bit too nostalgic in their quest to recapture the sound of their youth. In that particular quest, they managed to accomplish just that.